Picture Block — The Picture Block holds only one image and is the easiest way to display a single image. Picture Album — Holds collections of images with the possibility of displaying names and descriptions. General Text — In general text, pictures may be inserted along with text and links. 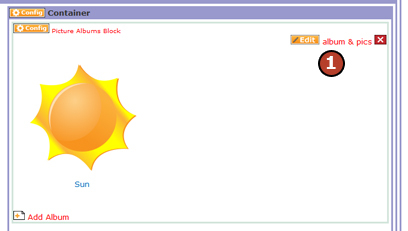 General text is found in the General Block and in other blocks like the Articles Block and Bulletin Boards Block. 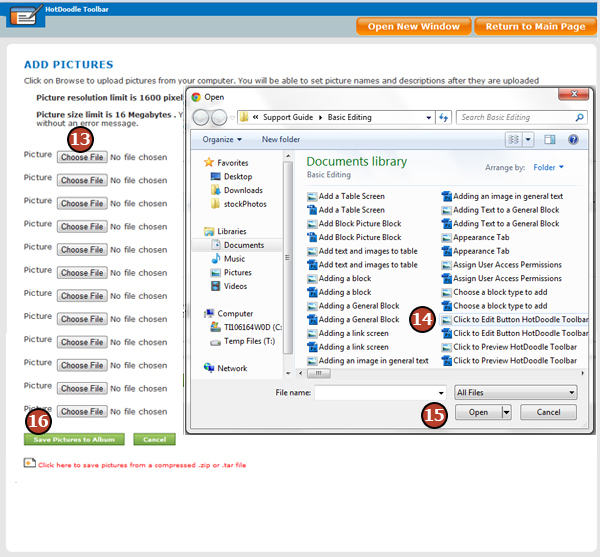 A Picture Album Block is a specialized block type within HotDoodle that gives a way to display multiple photos or images on the website. Photos can be viewed full-sized or even in a slide show. 2. Click on the "Add Block" button. 3. On the webpage, click on the "Add Here" button to add the Picture Album. 4. Click on "Picture Albums" button. 5. 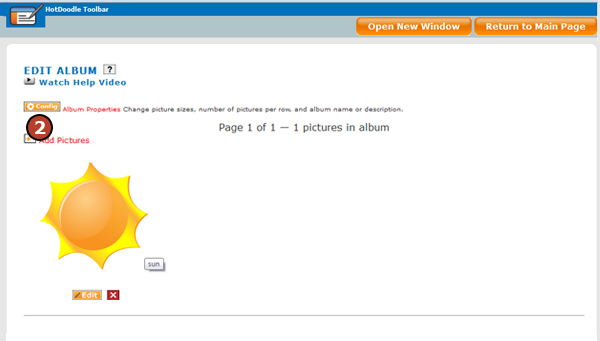 Choose the Picture Album view by clicking on it. 6. Click on the "Insert this block" button. 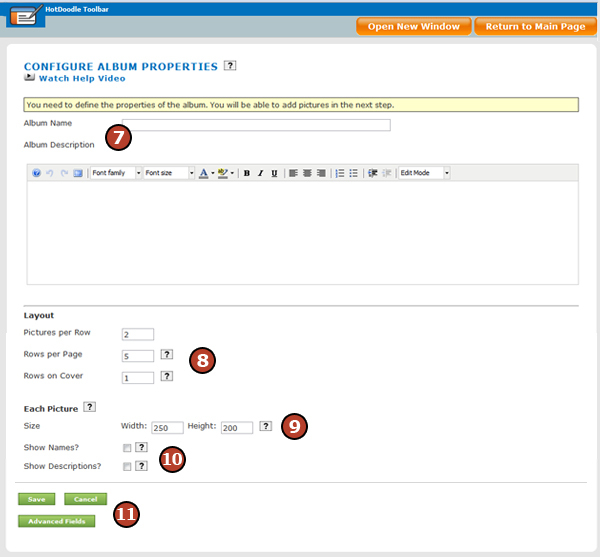 The Configure Album Properties screen appears. 7. Type a name and description for the picture album (optional). 8. 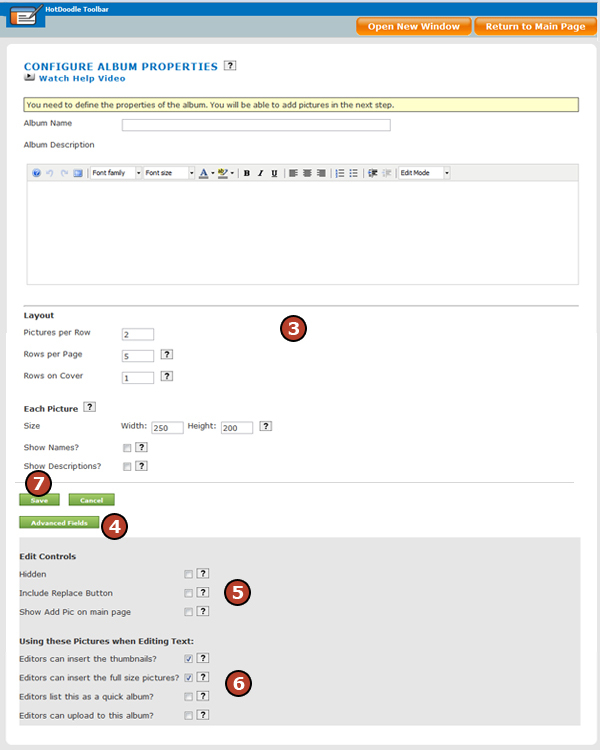 Type the number of images per row, rows per page and cover settings. 9. Type the height and width to display each image. 10. 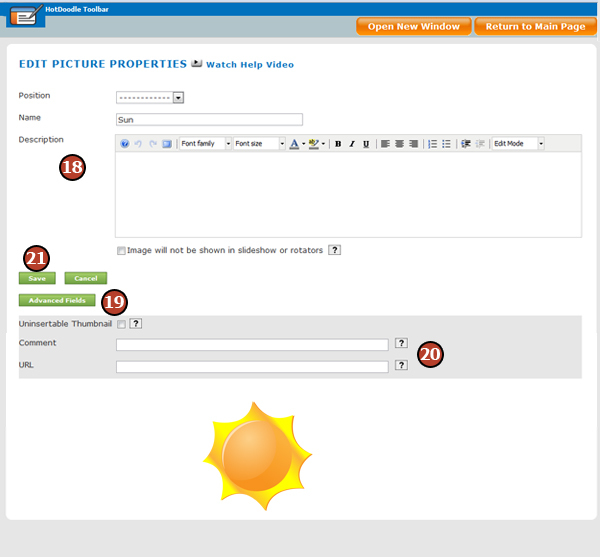 Use the checkboxes to indicate whether each image should display a name and description. The description appears above the image and the name displays below the image as a link. When the image or the name link is clicked, the image will open in a new screen as a slide in a slideshow. Use the arrows to cycle through all the images in the album. 11. Click on the "Save" button. The Edit Album screen appears. 12. Click on the "Add Pictures" icon. 13. Click on the first "Choose File" button. 14. In the pop up window, navigate to the image file on your hard drive and select it. 15. Click on the "Open" button to upload the image file. Repeat steps 13-15 for each available Choose File button. 16. Click on the "Save Pictures to Album" button. 17. The next screen shows the images in the album available for editing. To edit individual images, click on the "Edit" button below each image. 18. Enter changes to the image properties in the available fields. 19. 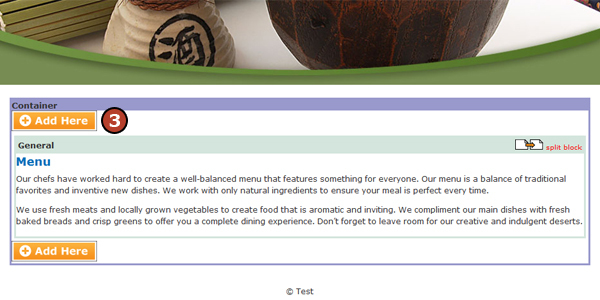 To view Advanced options, click on the "Advanced Options" button. 20. Enter a URL to turn the image into a link. 21. Click on the "Save" button. 22. Click on the "Return to Main Page" button when you are finished. 1. Click on the "Edit album and pics" link above the album. 2. Click "Config Album Properties." 3. Make any edits and changes to the Album. 4. Click the "Advanced Options" button to reveal the advanced option settings. 5. Choose the Edit Controls setting. 6. Choose settings for use of picutes when editing text. Hidden - Click to add a check mark in the Hidden box if the Picture Album will be invisible to visitors viewing the website. This album is always visible to the website owner (and to others with edit permissions). This feature is good for albums that hold images elsewhere in the website, not displayed as an album. This feature is also useful if an album needs to be taken offline to edit or update. Show Add Pic on main page - If set, the Add Pictures link will display on the main page of the gallery before the gallery is viewed or edited. Editors can insert the thumbnails - Click to add a check mark in this box to allow this picture album's thumbnails to be inserted in text editors. Editors can insert the full-sized pictures - Check this box to allow this picture album's full-size images to be inserted in text editors. 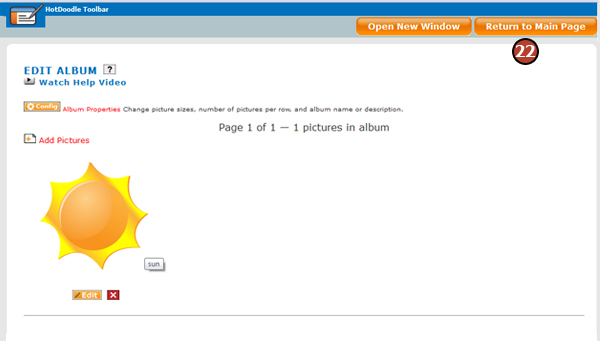 Editors list this as a quick album - Click to add a check mark in the box to display this album in the Quick Albums page that is easily accessed while editing. Most albums are intended to be seen, to organize and show their set of images to visitors. Some albums, however, are just holding images that will be shown in text boxes placed elsewhere. If these albums are marked as quick albums and allow uploads then the album is easily found when editing and the editor can directly upload from hard drives into the album. 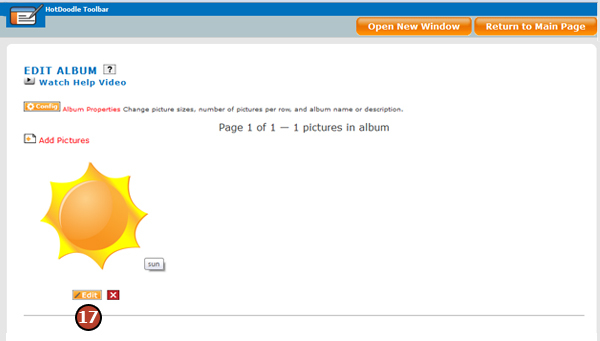 Editors can upload to this album - Click to add a check mark next to this box to allow editors to directly upload images into this album from a hard drive.